> Events in Pennsylvania > Pick the ONE workshop you would like to attend. Ladies, please step forward, keep your boarding pass in hand, discard any attitudes, pride, or preconceived notions before going through the security checkpoint. Check those bags of fear, pain, hate, jealousy (amongst others) before trying to board the plane.” Women of God, in this season, we are being called to wake from our slumber and arise to the things of God. Get out of your comfort zone. Walk into the unfamiliar. It's time for takeoff, but you must leave your bags behind. 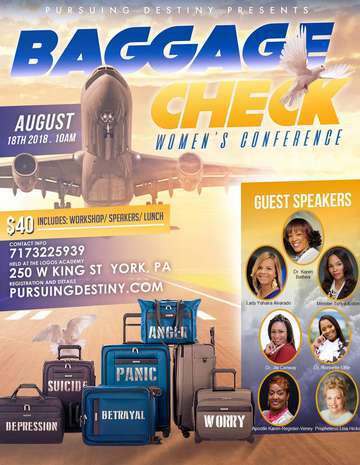 Come out and experience this women’s event designed to assist in checking any emotional or spiritual baggage that is keeping you from taking flight, and soaring to the destiny God has for you. Buckle your seatbelts!